In 2009, after five years of exploring Mars, NASA's Spirit rover hit an unexpected snag: a Red Planet sand trap. After it cracked through a hard layer of topsoil, Spirit was doomed to spin its wheels with Mars sand up to its hubcaps. NASA engineers spent months trying to free the robot through remote maneuvering, but the Spirit rover was ultimately unable to escape, and it went silent in 2010. 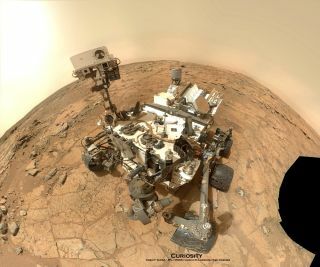 Researchers are now working on new software that they say could help prevent other interplanetary explorers, such as NASA's car-size Mars rover Curiosity, from running into similar quagmires. "There’s a lot of knowledge in civil engineering about how soils will react when subjected to heavy loads," MIT’s Karl Iagnemma, a principal research scientist in the department of mechanical engineering, said in a statement. "When you take lightweight vehicles" — like rovers — "and granular soils of varying composition, it’s a very complex modeling process," Iagnemma added. Iagnemma and colleagues say they have developed a video game-like model called Artemis to simulate and predict how a rover will move over a diversity of soil, which could help mission planners chart safer routes and maneuver out of tricky terrain. The researchers refined the model with performance tests in a lab, which included rolling a spare wheel from Spirit's twin, the Mars rover Opportunity, over coarse and fine soil. The team also tested Artemis against real-world scenarios, steering rover-like robots in the Mojave Desert's Dumont Dunes. Iagnemma hopes their model could help mission planners deal with unexpected challenging terrain, such as loose sand. "Think about the difference between beach sand, which you can walk on and even play volleyball on, and cake flour," Iagnemma explained in a statement. Artemis may even help the the mission planners for Curiosity, which landed on the Red Planet in August 2012 and is expected to traverse more challenging topography in the coming months and years. "There are goals for taking the rover into places that are more difficult to travel, like dunes and steep slopes," Iagnemma said. "That time hasn't really been reached yet, so there’s a little time to get the model refined for Curiosity." The research will be detailed in the Journal of Field Robotics.